Just concerned about Rocky potentially getting tagged by Hutchings. Thoughts? and Butters up to Bont. Only playing mid rookie is Walsh, and he will be hanging around a while. After many trades reversed .. Hoping to have enough left over to turn Williams into Laird next week. Not even bothering looking anymore from now. Expecting rookie carnage this week. Now thinking of going Sheed and Setters to Ross and Daniel/Heeney. Thoughts on which one? I'm assuming Daniel gets Def DPP soon and I like that flexibility going forward. He's also cheaper and I'll probably get Heeney for Burgess next week assuming Daniel gets DPP. So are those that have Dom Sheed in DT dumping now it's clear he can't co-exist with Gaff? Is $810k too much to pay for Whitfield in DT? Whitfield averaging 132 as a defender, he is pricey but probably worth it. Yeah Sheed gone for me, was going with Neale but i might just go Macrae instead. So Reilly O’Brien in AF or DT anyone. The ship has probably sailed in AF and he’s more expensive than I would like in DT, but still considering? So... on that point of ROB in DT. If I trade Fort to ROB and do my planned Cousins to Stack trade, I won't be able to afford to go Scott to Ross and Parker/Petrucelle to Kelly like I'd planned next week. It would, however, give me a lot of cash to play with later on, and I could just wait a week for Kelly to close that gap (assuming Kelly loses a little more cash and Petrucelle makes a little bit more. Is it worth hurting the now a little to help the future? I think there are always rounds through the year where you are going to have hurt now to help the future. It's annoying that ROB is that little bit more in DT, otherwise it would be a no brainer. Sauce now listed as 4 to 6 weeks due to ongoing issues with his knee. 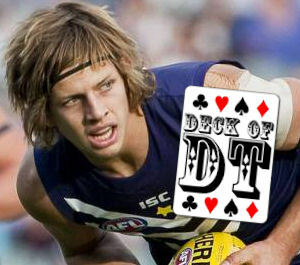 Im considering him for Westhoff at the moment!